Yacht Cruising among the islands of the Aegean and along the coast of the Mediterranean must rank among life's extravagant pleasures... Cruising from island to island and inlet to inlet, being waited on in style and living in comfort, swimming in deserted bays or mooring in an ancient harbor to visit a classical city, the life style is unrivalled, sybaritic and totally relaxing. It is the best way to view the breathtaking Turkish coastline. The chosen cruising ground is rich with historic sites, ancient cities and unique rock tombs. The experience of seeing blue waters and green nature embrace each other can only be described as priceless. The crystal clear water makes it ideal for swimming, enjoying water sports and exploring marine world. Sit back, relax and let the experienced captain, crew and chef take you on a journey that will stay with you forever. Blue Cruise's specially designed hand crafted Gullet's provide for every comfort of modern travelers. Gullet's are traditional Turkish motor vessels, beautifully crafted designed to ensure the Gullet holiday is one of the most memorable available in Turkey. If you really want to have life's little luxuries on board you must try deluxe gullets. The deluxe Gullet's is larger than the standard Gullet with the bigger lounge and hairdryer, shower cubicle with hot water and air conditioner. The interior saloon is fitted with television, stereo hi-fi system and a fully stocked bar. There is plenty of space on deck for sunbathing, relaxing under awnings and eating outside. Luxury Gullet's are also equipped with a large deep freezer and icemaker. 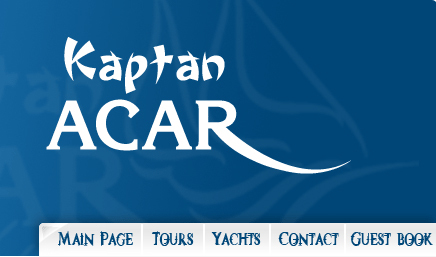 Each vessel has a minimum crew of three, captain, chef and steward for a safe cruise, free of chores and worries. Dishes of mouth-wateringly delicious Turkish and Mediterranean cuisine are prepared to a high standard of hygiene, presentation and taste. Luxury Gullet's are not only splendid sailing vessels but also excellent water sports platforms with windsurfer, dinghy, fishing and snorkeling equipment for your pleasure on board. Certainly the best way of getting everything you expect from a sailing holiday. Relax on board a luxury Gullet whilst the captain and crew do all the work, leaving your cares and worries behind. The choice is yours.